Home/Dive Shop, News, Sabah Travel Centre/The new Downbelow is breaking through! 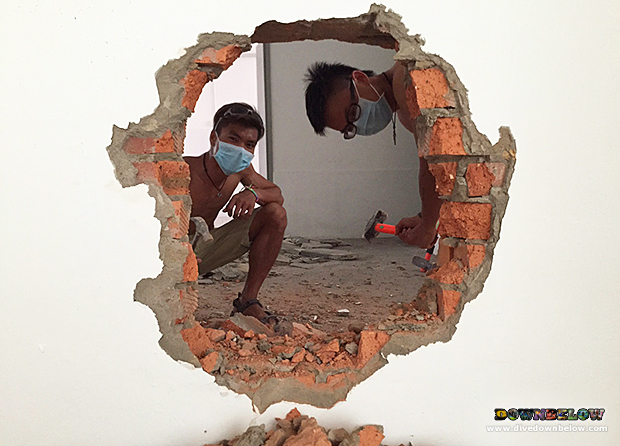 The new Downbelow is breaking through…on its new premises! Downbelow Marine and Wildlife Adventures’ new and improved Sabah Travel Centre and Kota Kinabalu Dive Shop is physically starting to shape into our vision. We simply can’t wait to start filling the place with our own unique and colourful character that is just so…Downbelow! The hole in the wall is just the beginning; a few of our island staff team took a few hours to hammer the wall down completely, and now it opens up our travel centre that much more…on the first floor, that is! Oh, yes! Downbelow’s Kota Kinabalu HQ will be more than the ONE floor of offices, which our current premises is at the moment. So, there’s a…’kitten out of the bag’ for you all! There’s going be 2 floors…at least! Get more information about the Big ‘Downbelow’ Bang when you follow our facebook and twitter updates, on which we are very active on! Very active – as in, on a daily, hourly basis!